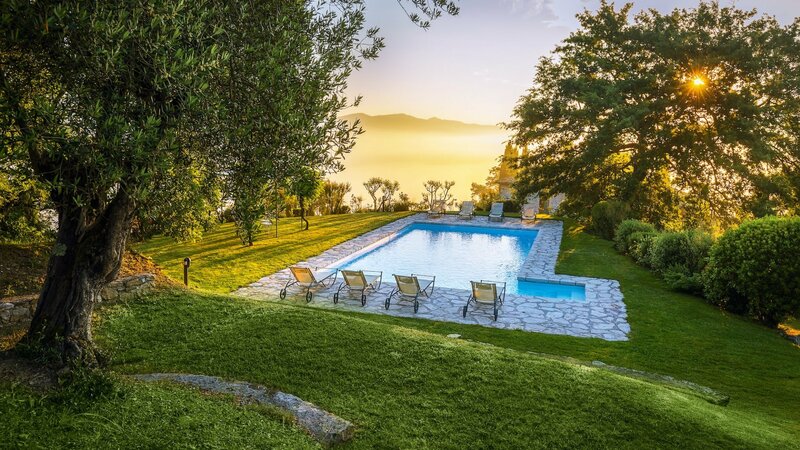 With a commanding panoramic view over the tranquil rolling countryside, villa Ada has a truly special quality about it. 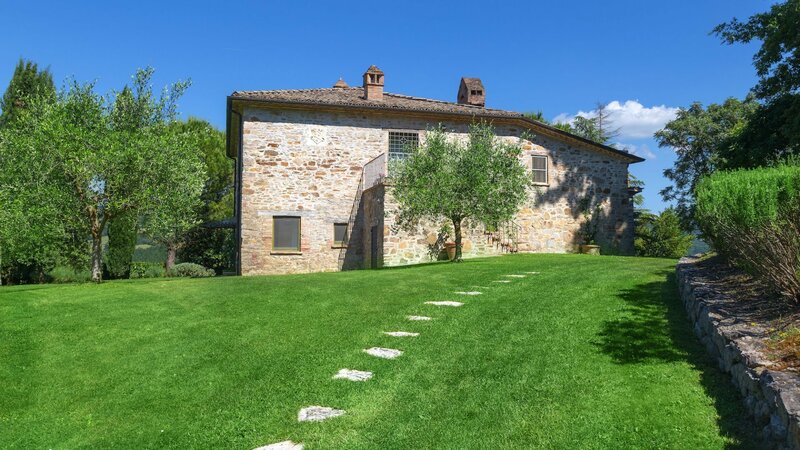 Only a stone's throw from the Tuscan border, it peers down over the famous Tuscan landscape from its perch on the top of a hill, offering luxury in an exceptional setting. 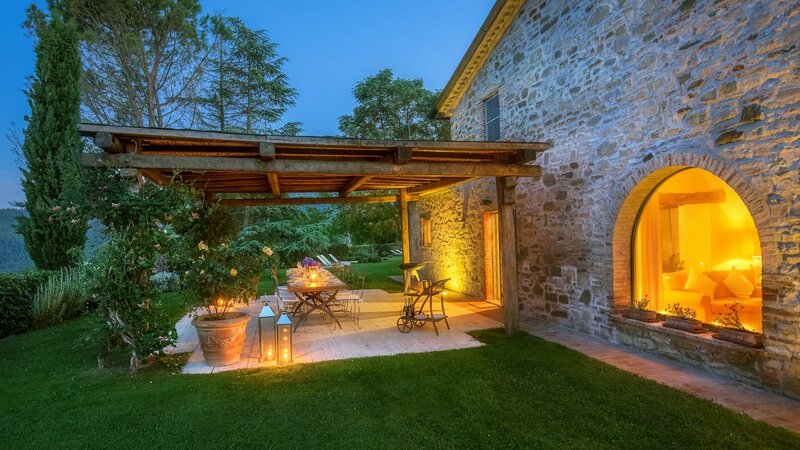 It comprises a large stone farmhouse (main villa) and its annex (guest house) just 40 metres/0,02 miles away. Each house has its own driveway and parking area. The swimming pool is situated on a raised terrace next to the villa, enjoying spectacular views of the surrounding countryside. A pretty pergola alongside it offers welcome shade in the heat, as well as a table so you can enjoy a drink whilst watching the sun setting over the dramatic scenery. 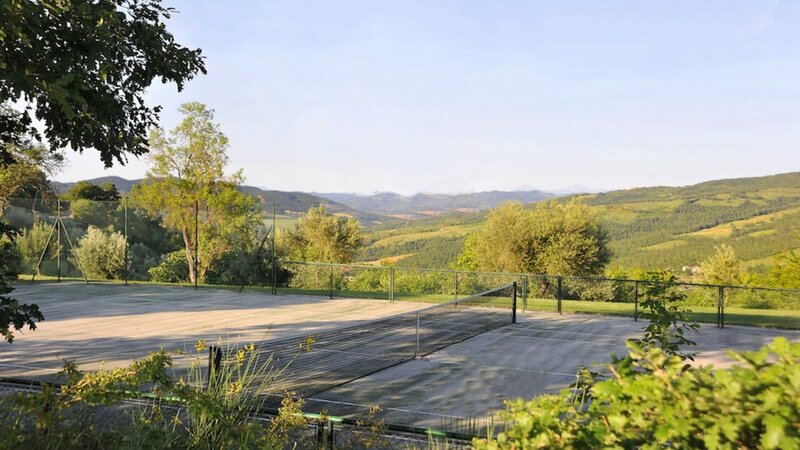 A shared hard tennis court located in an exclusive club nearby can be used by villa Ada guests, only 3 minutes away by car. 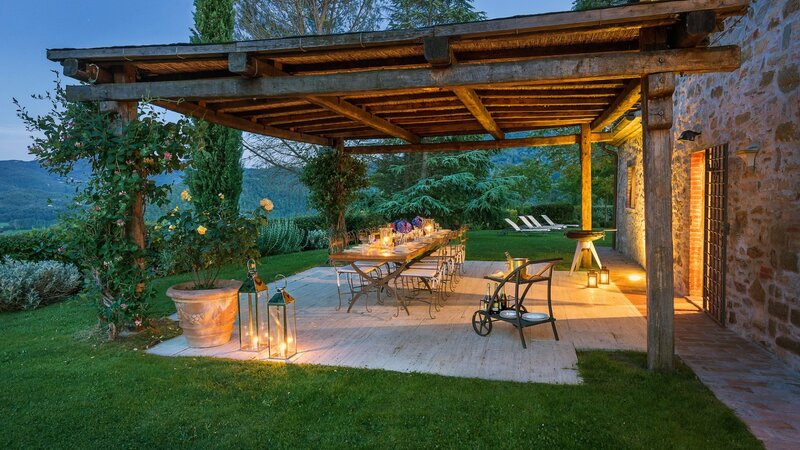 Set in a large garden, the main villa has an attractive pergola entwined in climbing roses, shading a large dining table which can comfortably accommodate 14 people. With stunning views and a superbly peaceful location, it makes for a very inviting place to dine. There is also a well-equipped BBQ, and several comfortable sun-loungers dotted about the garden to allow you to unwind and soak up the delightful atmosphere. A well-equipped kitchen with an American-style fridge leads out onto the pergola, making it convenient to eat outside. 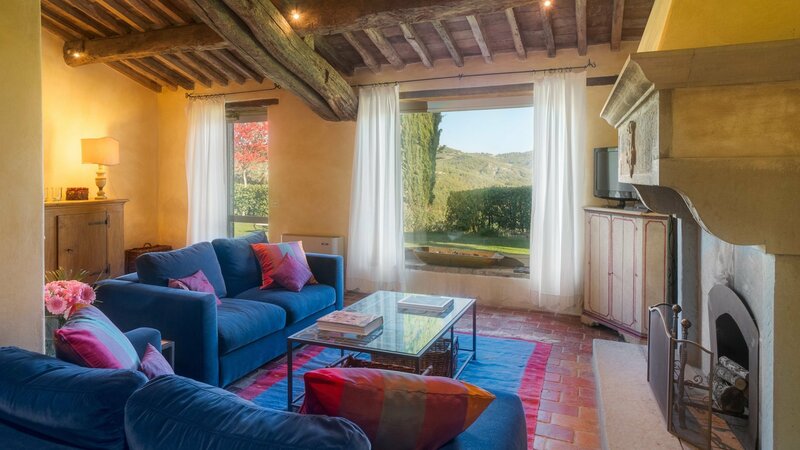 Large picture windows in the living areas of both houses maximize the enjoyment of the rolling Umbrian hills, the owners having taken their inspiration from the spectacular vistas all around, and the regular dramatic sunsets on offer. 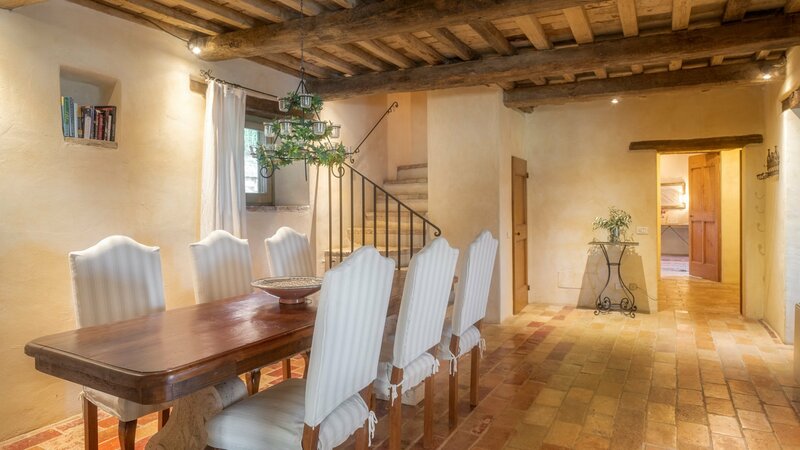 They have carefully restored both properties to the same high standard, with attractive décor throughout and using prestigious materials: antique doors, 18th Century oak-beamed ceilings, stone fireplaces and old terracotta floors. The property has been tastefully yet comfortably furnished with some beautiful antiques and quality furnishings. This villa is perfect for two families sharing a holiday together, whilst allowing each a good level of privacy. The smaller house also has a pergola with a table suitable for 6, perfect for an al fresco breakfast. 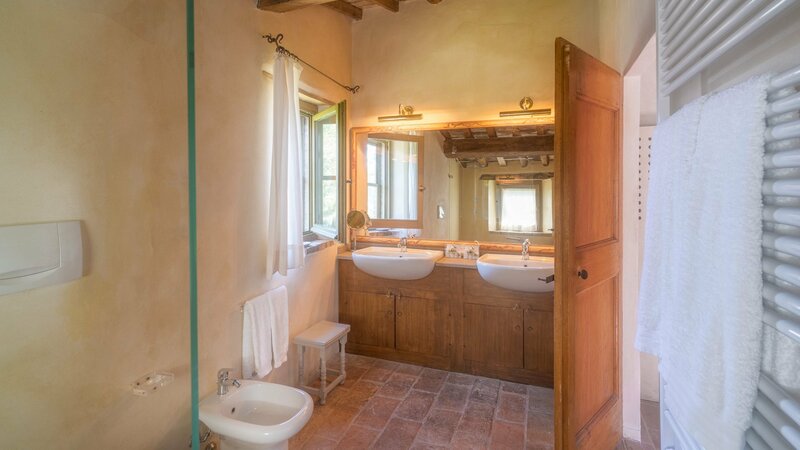 The owners have really enhanced what Villa Ada has to offer, located as it is in an enchanting and unspoiled part of Umbria. You can happily amble along the country lane to a recommended restaurant (Calagrana) offering reasonably-priced delicious meals, typical of the local region. 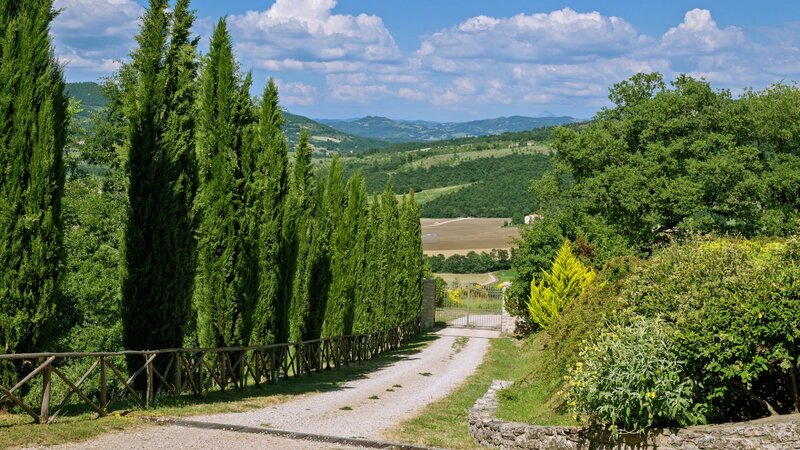 Here, in the area of Cortona - Umbertide, you can experience some of the most fascinating medieval towns, delightful restaurants and trattorias, golf, wine tasting and leisurely walks. Its strategic geographical position allows you to visit many places of artistic and architectural interest such as Cortona, Siena and Gubbio, as well as the beautiful Lake Trasimeno. During the low season, it is possible to rent either the main villa or the annex separately, the other remaining closed during your stay, allowing you perfect privacy and peace. Villa Ada is a highly recommended property, offering value for money as well as a uniquely tranquil setting, conducive to total relaxation. large character-full double living room with fireplace with two sitting areas, TV, dining area with a large with view of the garden. Fully equipped kitchen with a full range of modern appliances including a Nespresso machine, direct access to the garden. bedroom 1: twin bedroom, beds 100cmx200cm/39x79inch (convertible into double on request), 1 bathroom with shower. access via both external and internal staircases. bedroom 2: master bedroom (bed size 170cmx200cm, 67x79inch) with en-suite bathroom with shower with a view of the valley. bedroom 3: double bedroom (bed size 170cmx200cm, 67x79inch) with en-suite bathroom with shower and double basin. bedroom 4: double bedroom (bed size 170cmx200cm, 67x79inch) with en-suite bathroom with shower with panoramic view. large gazebo with table seating up to 14 people and a BBQ. living/dining room with fireplace and large panoramic window. Large kitchen with fireplace (non working) and a full range of modern appliances. bedroom 5: master bedroom (bed size 170cmx200cm, 67x79inch), 1 bathroom with shower. bedroom 6: twin bedroom (beds size 120cmx200cm, 47x79inch), with direct access to the pool area, 1 bathroom with shower. bedroom 7: double bedroom (bed size 180cmx200cm, 75x79inch, convertible into a twin bedroom), 1 bathroom with shower. gazebo with table for 6.
grocery shops 3km/2miles (Spedalicchio), supermarket 11km/7miles (Umbertide), restaurant at walking distance (about 500mtres/0,31miles), other restaurants 4km/2,5miles, wine tasting 4km/2,5miles, nearest golf course 22km/13miles, shopping at a direct organic vegetable producer at 4 mins drive. pets allowed (please notify on booking). Gravel road 3km/2miles in good working condition. At time of booking, we can guarantee your sole occupancy of the site for the duration of your stay. The tennis court is located in the neighbourhood and it is available for guests’ use, subject to availability (during the week it is open from 8.30am - 7pm, closed on Sunday). Umbertide 9km/6miles, Cortona 29km/18miles, Gubbio 33km/20miles, Lake Trasimeno 34km/21miles, Perugia 48km/30miles, Montepulciano 56Km/38miles, Arezzo 65km/40miles, Siena 105km/65miles, Florence 145km/90miles, Pisa 220km/136miles, Rome 240km/150miles. airports: Perugia 40km/24miles (43min drive), Florence 145km/90miles (1h50min drive), Rome 270km/ 167miles (2h30min drive). "We have had the most delightful time and it really is a beautiful house in the most wonderful spot. Thank you for all your help whilst we were at the villa and for all your useful suggestions. We all enjoyed the villa, its great style and its location." "We thoroughly enjoyed our stay at Villa Ada. 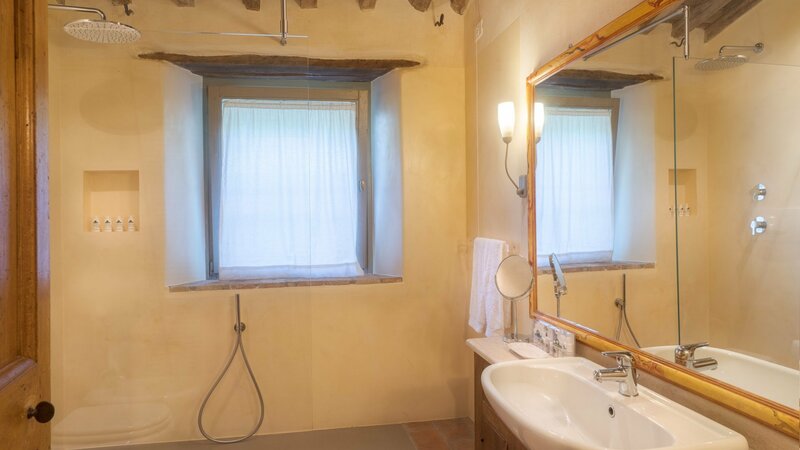 We found both houses to be equally inviting with comfortable beds, nice linens, well stocked kitchens and typical Italian decor. The garden and pool area were nicely landscaped and very well tended, the villa offers majestic views. The Home in Italy concierge staff was extremely helpful, as was Sonia at the nearby tennis court. We would definitely recommend this property." "Home in Italy is obviously a well managed company with very helpful and responsive staff. Rachele was a pleasure to work with over the week! Many thanks!" "Villa Ada is superb, from the twin standpoints of its accommodations, equally the main villa and the guest house, and its location. This property has been restored exceptionally well, with excellent taste in conveniences, appointments and furnishings. The bedrooms are spacious, more than sufficient, and the main bathrooms are lovely, large and convenient (the smaller bathrooms are a little tight). 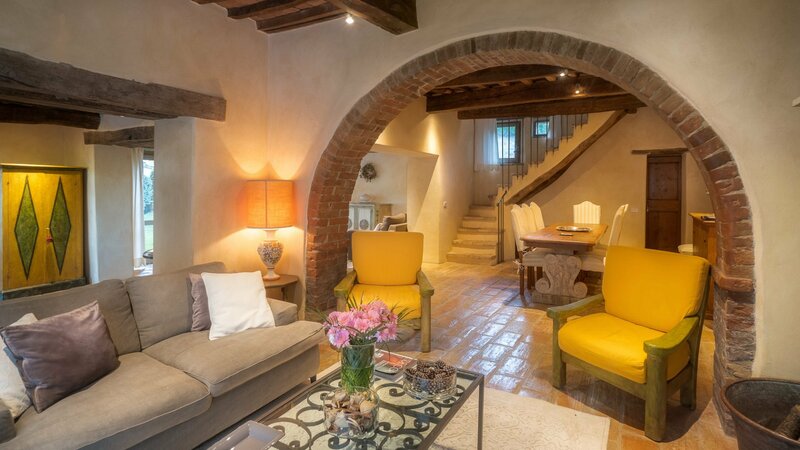 The two houses feel genuinely Italian, appropriately modernized, and are very comfortable, good for mixed groups and families, with plenty of opportunity for both togetherness and privacy. The grounds and the views are extraordinary. Working with the Home In Italy staff (first Daniela, then Rachele and Elena) was a great pleasure; I felt as though they were my agents, my hosts and my friends. While there were minor, short-lived difficulties with the heat and hot water (one day in the guest house), and the TVs did not work at first due to a storm that knocked-out the satellite service, Rachele managed the attention we received from Elio (the groundskeeper) and outside technicians professionally and with great care. We could not have asked for better attention to all the details. 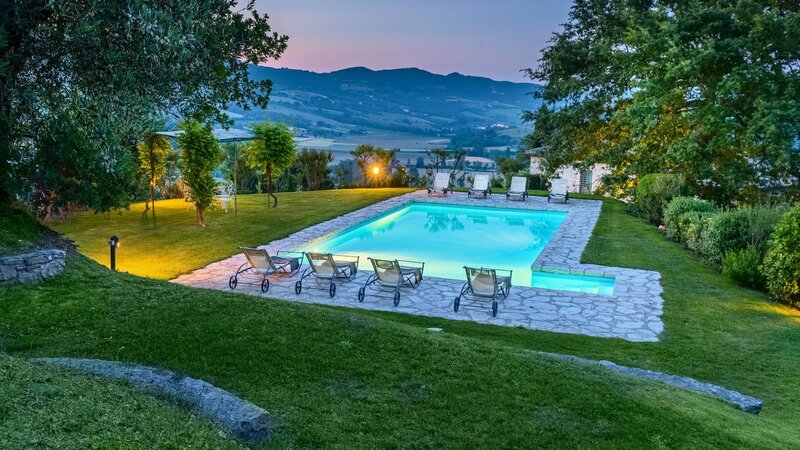 I will not hesitate to call Home In Italy again the next time a trip to Italy would be served well by the rental of a superb villa, according to these high standards." 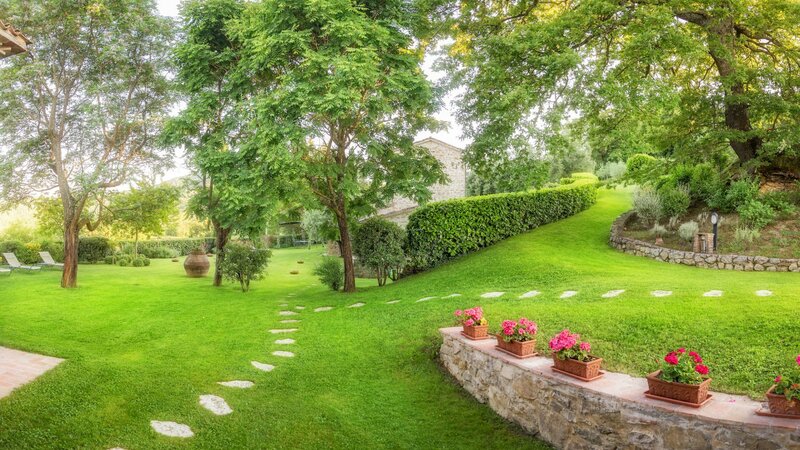 "The Villa Ada is a beautiful Villa located high in the hills of Umbertide, Province of Perugia, Italy. The location is remote and you will need to rent a car to provide access to any of the small towns surrounding the villa. 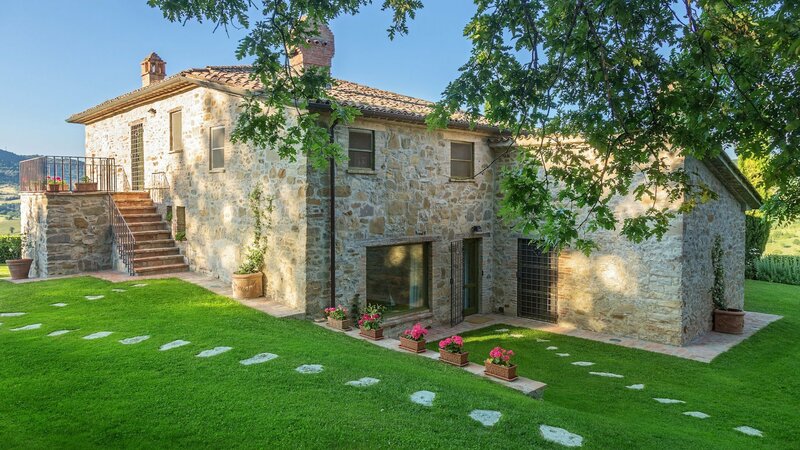 The Villa consists of the farmhouse and guest house. Both properties are beautifully decorated and have all the amenities needed, including hair dryers, washing machines, and refrigerators with ice makers. We rented this property for one week after spending time in Sant'angelo and Rome. It was a lovely way to wind down and explore the small towns of Italy and get a real taste of this beautiful country." - the beds are very comfortable and the linen and towels clean and in good condition. We could not fault the Villa in any way and would be delighted to return to the property." 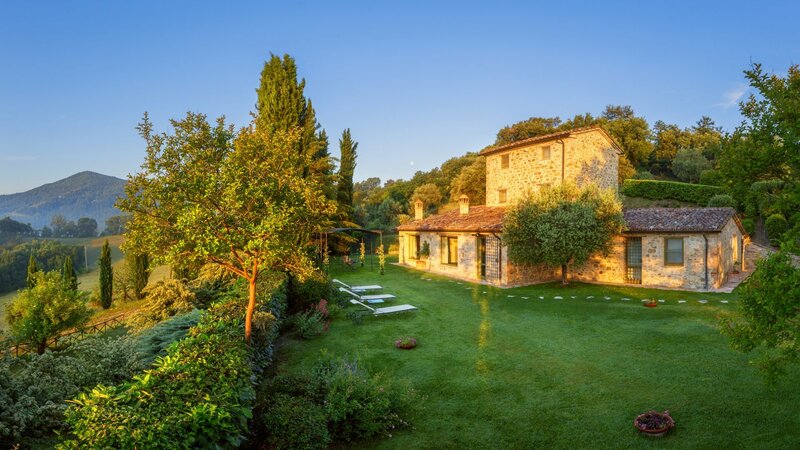 "After deciding to elope to Italy, I started a 6 month search for the perfect villa. I was looking for the perfect blend of traditional with modern conveniences. Cleanliness and breathtaking vistas a must! Once I connected with Rachele ~ the concierge, the arrangements for the accommodations had the utmost attention. The pictures did not do the villa justice ~ they were beautiful, but could not prepare me for this remarkable villa. The vista views were from high on the mountain overlooking the valley. The grounds were impeccable and loaded with flowers and olive trees (even poppy fields nearby)! I loved waking up to the animals and birds ~ wishing me a good morning. Upon arriving at the villa, I had the pleasure of meeting the owners ~ we talked for hours, ensuring all our accommodations were to our liking! All was perfect!" "Villa Ada was the venue for our wedding in May 2016 and could not have been more perfect. There was a villa for our family and the guest house for friends with plenty of space for people to be with each other and spend time alone as well. The pool, although very very cold in early May, was too inviting to ignore and became a space for relaxation. The inside space was as fabulous as the outside which was great because the weather wasn't ideal for outdoor weddings! We still had our first dance under the pergola on the terrace though! The villa felt luxurious and cosy as well as beautifully open to the landscape which we could not drag our eyes from. Home in Italy staff were great giving me lots of advice to help with the wedding and giving me the contact for my wedding planner. When we had some issues with hot water, a solution was found really easily and quickly. Home in Italy also booked us on a wine tasting trip which was amazing! We felt looked after throughout. We can't wait to come back! Are you open at Christmas???" 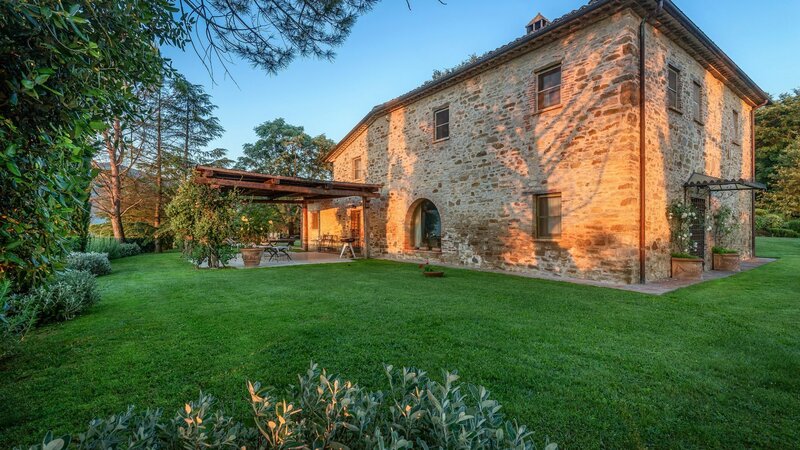 "Couldn't be better Home in Italy service invaluable and superb. Many thanx"
first of all sorry for taking a while but as i arrived back in Germany many jobs were waiting. So busy in this autumn but now I take the time to give you my feedback. The location Villa Ada was just great for our production. Even if the weather was kind of tricky (mornings full of fog) we did manage to shoot all what was planned. For our next time we just have to talk about the heating system ;-) We didn`t expect this cold but it worked out well in the end. Thank you very very much for your support during our stay. You did an excellent job and me and my team where very happy to have you „behind“ us. Looking forward for the coming projects in autumn and hope to get back to your sweet portal as soon as possible." "I'm happy to give my feedback, which is mostly positive. Villa Ada is a beautiful, gracious home. It has been beautifully renovated, designed and landscaped, and was a perfect place for three couples to stay. I particularly want to commend and thank Chiara, who was available to me at all times for many small problems, and who was always quick to offer a solution. She really made the trip more pleasant. I am back in New York now, but part of me is still sitting on the patio, looking at the beautiful, peaceful view."